Somalia officially called as Somalia Republic. It lies in Eastern part of Africa. Somalia is having the longest costline on the continent. It lies between latitudes 2°S and 12°N, and longitudes 41° and 52°E. The national flag of Somalia was designed by Mohammed Awale Liban. Its blue in color with white color star in center. It was adopted on Oct 12, 1954. The first time the word Somali was mentioned was in a book dated back 3500 years ago. In the book, it is mentioned that then Egyptian Queen Hatshepsut sent 5 ships to the region of Somalia, along with 250 of her men, to establish the exchange of goods. Called The Land of Punt, which means the land of "spices," the Egyptian queen sent jewels and glass beads to the land of the Somalis to exchange gold, myrrh, ostrich feathers, spices, and elephant husks. During the 7th and 9th centuries, Muslim Arabs and Persians came and established trading posts along the coast. The region was unknown to the Western world until the Portuguese "discovered" the land while on their way to India. They called it Terra Incognita, which means, "unknown land." This discovery led to the influx of Europeans who came to sail in the region. By the 19th century, several European powers came into the region and fought over control of the land. The British, Italian, and French empires played an active role during the 1800's. In 1884, Somalia was split into 4 regions, namely: the British Somaliland in the north, Italian Somali in the south, Ogaden in the west, and French Somali in the Djibouti coast. During the late 1800's, a movement consisting of a group of rebels was created, resulting to the Somali resistance and formation of their own army called the Dervishus. The group built their headquarters in Taleex in 1901, and sparked the beginning of a long struggle against the colonial powers. In 1960, Somalia achieved independence but their government was unstable. A coup d'etat occurred in 1969, where the leader of the opposition, General Mohamed Siad Barre, became President until 1991, when his government was overthrown. Because no one person stepped up to the plate of leading the country, there was no central government for the next 2 decades - but a transition government took effect, which was the Transitional Federal Government or TFG. The TFG was plagued with anarchy and corruption, and upon its end in 2012, it was replaced by the Federal Government of Somalia with an elected President. 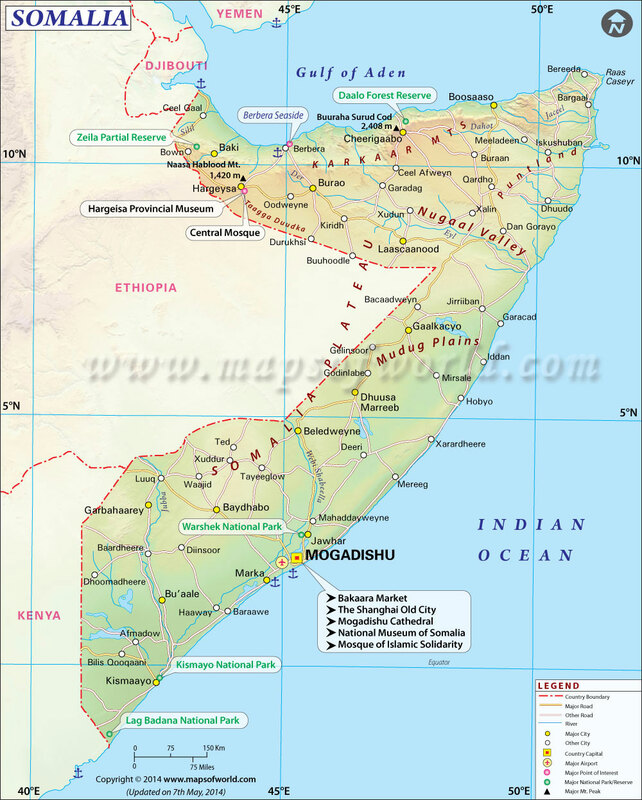 Somalia is located in Eastern Africa, within the geographical region called Horn of Africa. Its borders are Ethiopia to the west, Djibouti to the northwest, the Gulf of Aden to the north, Kenya to the southwest, and the Indian Ocean to its eastern coast. The general terrain of the land area consists mainly of plateaus, plains, and highlands. Somali comprises the mainland and the archipelago that defines its coast, which includes the islands of Bajuni and the Saad ad-Din archipelago - making up the longest coastline in Africa. Since the end of the transition government of TFG in 2012, Somali's government has been headed by the Federal Government of Somalia. Although many groups still resist the leadership, the new government is slowly making the transition for a centralized government in the country. The federal government consists of the President, who is elected into office by the Parliament, and serves as head of state. The President chooses his Prime Minister, who serves as head of government and head of the Council of Ministers or the Cabinet. Somalia is a federal parliamentary republic with a bicameral Parliament - consisting of the upper and lower house, where members of the latter must consist of at least 30% women, as stated by law. Somalia is notorious for its civil war and ongoing violence. Despite its tainted image, the country still has a lot to offer for travelers, such as historical sites, national parks, and unspoiled beaches. One of the most iconic landmarks of Somalia is the Bakara Market in the capital of Mogadishu. Displaying the colors and flavors of Somalia, this open-air market is filled with street food vendors and stalls selling cheap national souvenirs. Another tourist attraction in the capital is Shanghai Old City - it is dominantly controlled by warlords but when conflict is not present, it offers the best scenic area of Mogadishu. The wealthy district is home to luxury accommodation, as well as beautiful Chinese architecture. Laas Geel is another Somali top tourist attraction - located in the autonomous region of Somaliland. The series of caves found here contain hundreds of ancient paintings from the Neolithic era. Considered to be one of the best-preserved in the world, the only reason it has not achieved a UNESCO World Heritage Site status is due to the ongoing political conflicts about the legitimacy of the region. The beaches of Berbera and Sinbusi are the best beach offerings of Somalia - underdeveloped and unspoiled by tourism, these gorgeous beaches offer blue waters, soft sand, and plenty of opportunities for water sports. The government of Somalia spends 15% of its national budget on the education system. Primary education is not free for most of the country, but it is for the autonomous regions of Puntland and Somaliland. In the former, over 100 schools have been built since its implementation of free education in 2006. For the rest of the country's rural areas, Qu'ranic schools are frequently the only accessible schools - which provide traditional Islamic education to children. From 1991 to 2012, Somalia was the only country in the world without a central government. Somalia was the first African nation to be used for flying warplanes by the British. Somalia has one of the most advanced telecommunications systems in Africa - and it's also the cheapest with calls costing less than 1 cent per minute.